8 1/2 x 11 inches. "An Ordinary Evening in New Haven"
The poems in Frolic Architecture were inspired by Susan Howe's experience of viewing various manuscripts, sermon notebooks, books, and pamphlets of the eighteenth century American Calvinist theologian Jonathan Edwards in the vast collection of Edwards family papers at the Beinecke Rare Book and Manuscript Library in New Haven, Connecticut. Especially by the folder in Box 24 titled "Wetmore, Hannah Edwards, 1713–1773, Diary, 1736–39, copy in the hand of Lucy Wetmore Whittelsey, with commentary/n.d." Using multi-purpose copy paper, scissors, "invisible" scotch tape, and a canon copier pc170 she collaged fragments of this "private writing" with a mix of sources from other conductors and revealers in the thick of things—before. In August 2009, James Welling produced a group of black and white photograms on 8 x 10 inch Kodak Polymax Fine Art paper. He painted on a thin-enough-to-fold sheet of clear mylar and placed this on top of unexposed photographic paper. After exposing and processing the sheet Welling added paint to the mylar to make additional unique photograms. Eventually the mylar became covered in paint and Welling began again with a new sheet of mylar. In Frolic Architecture Welling used three mylar sheets. In the photograms Welling acknowledges the collection of Edwards Family material at the Yale Beineke Library that Susan Howe encouraged him to look at before beginning his work on Frolic Architecture. Frolic Architecture, a sixty-eight page book, comprises forty-eight collage poems by Susan Howe printed letterpress on Somerset paper at The Grenfell Press by Brad Ewing, and ten photograms printed in James Welling's studio. 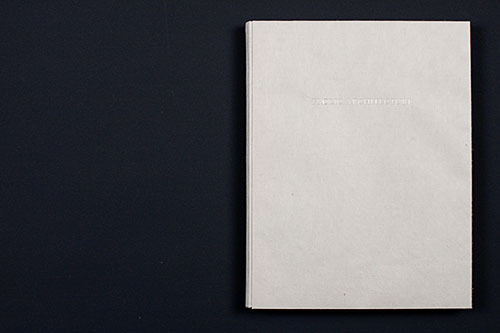 The book was bound by Claudia Cohen using handmade Izumo Mitsumata-shi and Cave papers. The book, published in an edition of twenty-six, is issued with a separate, signed photogram/poem.